Greetings from New York! 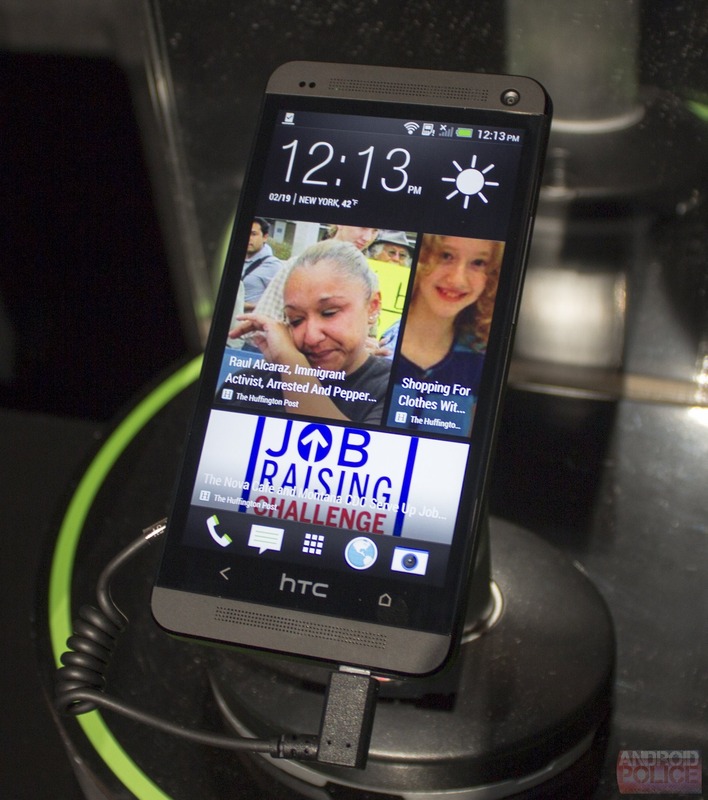 I’m here at HTC’s press event checking out the HTC One. 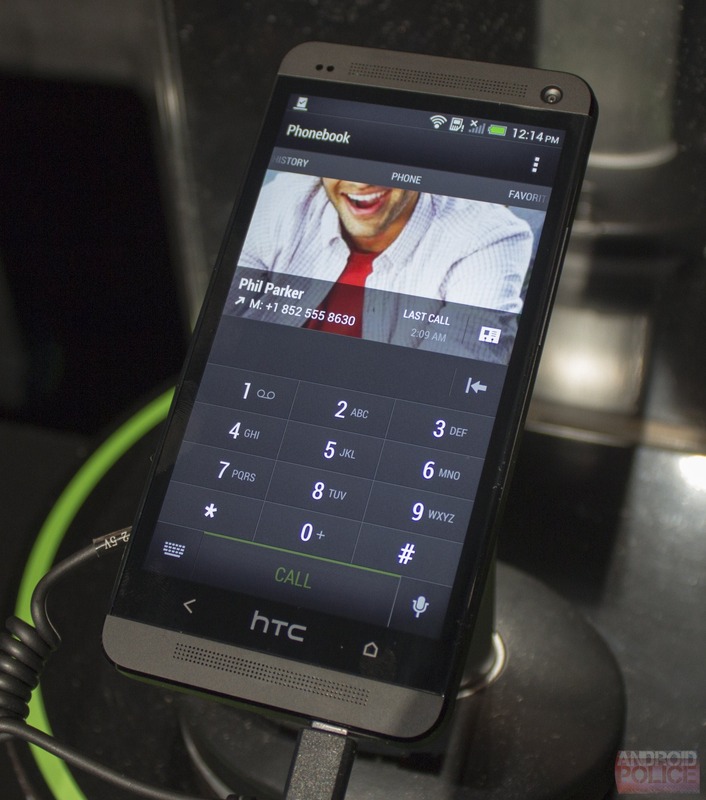 Yes, that’s just the HTC One, the phone previously known as the M7 is all grown up and sporting the plainest version of HTC's "One" branding yet (which we are totally in favor of - Hopefully the carriers leave it alone). But who cares about the name, what is the actual device like? We'll I've had a limited amount of time with it, but so far I like it. 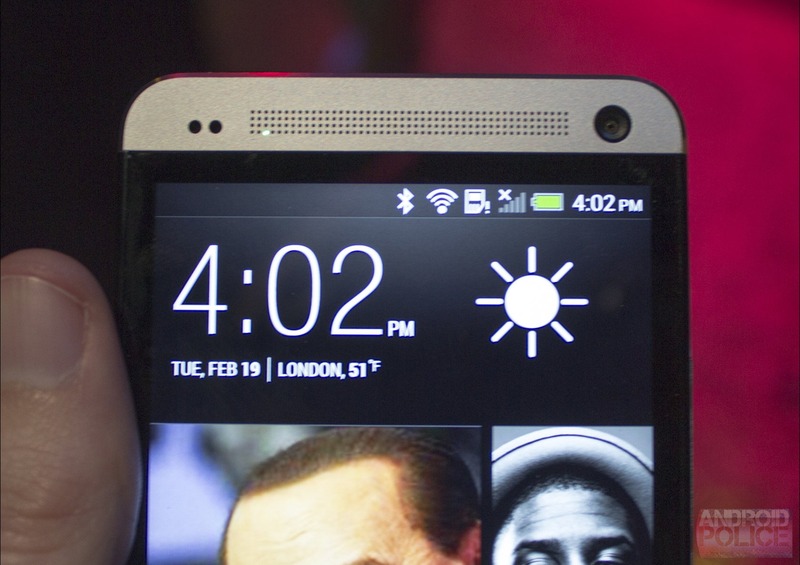 HTC is touting an all-aluminum, no-gap construction, and in person it's very nice. You can't get an exact feel for how it is to hold because they've got them anchored down to the tables, but it seems like it's very well constructed. It's surprisingly light, even with the tether attached to it. The antenna is integrated into the aluminum body, so, other than a few small slits of plastic on the back, it's entirely metal. There's no need for plastic windows. The aluminum has a smooth finish, but it didn't seem too slippery. It's a great change of pace from the usual plastic. I really prefer the black version to the silver. 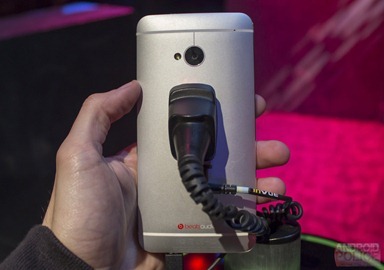 Between the speakers, camera, and sensor cluster, the front of this phone is a little too busy for my taste. The black version does a decent job of hiding all that stuff, while the silver version only serves to bring attention to them. The black version also blends in a little more with the black screen bezel, giving it a more minimal look. Either one looks great in person, I just prefer the obelisk look. Here's my attempt at a hands on video. HTC set up the worst possible environment. It's really dark and really loud. 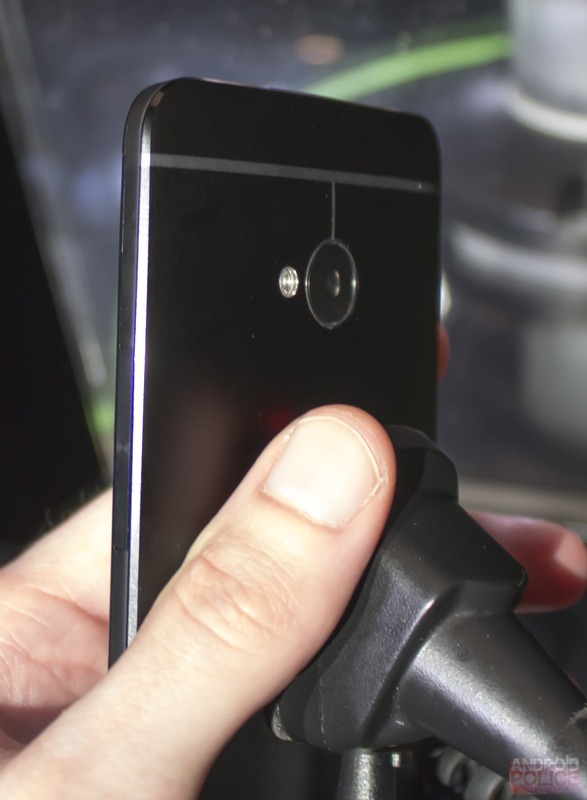 The 4.7-inch, 1080p panel on the HTC One is very similar to the one the Droid DNA, which is a very good thing - these pixels will give reality a run for its money. It looks worlds better than a standard issue 720p display, and is nothing short of the most beautiful LCD ever created for anything. Everything is bright and vivid, and you will never, ever see a pixel. David took issue with the Droid DNA outdoor performance, so we’ll have to see what that is like once we get one in for review. HTC would not let me take one outside. I asked. HTC has been on quite an audio kick since acquiring Beats Audio in 2011, and with the One, they are turning things up to eleven another notch. 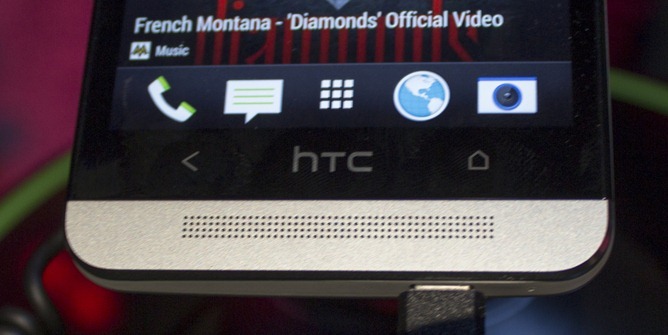 The top and bottom bezel of the phone is adorned with a pair of giant speaker grills. That's right, speakers, aimed at your ears - two of them, in fact. The amount of common sense on display here is impressive. It’s great to see a manufacturer step away from the photocopy machine and do something no one else is doing. I will never understand why all other phones insist on aiming the speaker away from me. The speakers themselves sound great. It’s the best non-headphone audio you’ll hear from a smartphone. They’re loud, clear, and pointed at you - it's a great combination. You aren’t going to want to pump dubstep out of these all day or anything, but you’ll definitely be happy watching YouTube clips or listening to the chirps and squawks of Angry Birds (I am not a gamer). If you’re more into headphones, HTC’s usual (read: excellent) headphone amp is along for the ride, too. 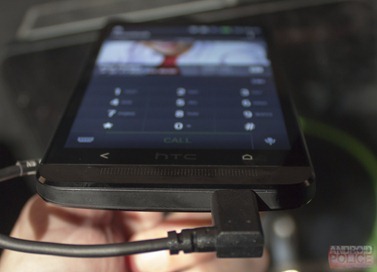 Yes, it’s real, and yes, HTC are out of their minds. This button cluster is a mess. Smack in the middle of the back and home buttons is an HTC logo. It's not actually a button at all, it doesn't do anything. It's just there for branding purposes. That means we are only down to two buttons. HTC’s “Our branding is more important than your usability” mentality means the Home button has been kicked to the right. "How do you get to recent apps, then?" you're asking. You have to double tap on the home button. It's weird, and I guess you'll eventually get used to it, but it’s a really bad design decision. They really couldn't find anywhere else to stick their logo? Long pressing on Home will open Google Search, (not Google Now). As far as I can tell, there's no way to get to Google Now cards from the system buttons. 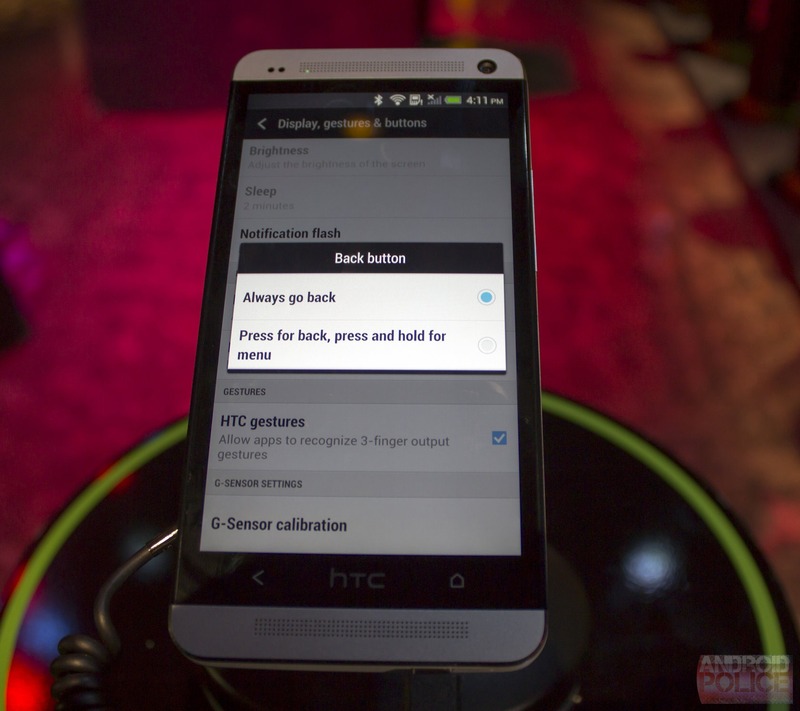 In addition to the home button craziness, I spotted an option to set long press Back to Menu. Sense is now up to version 5.0. They've taken the first home screen panel and turned it into a Windows Phone-inspired news reader called "Blink Feed." It will read news and pull in stuff from Twitter and Facebook. I don't really get why this is a home screen and not an app. 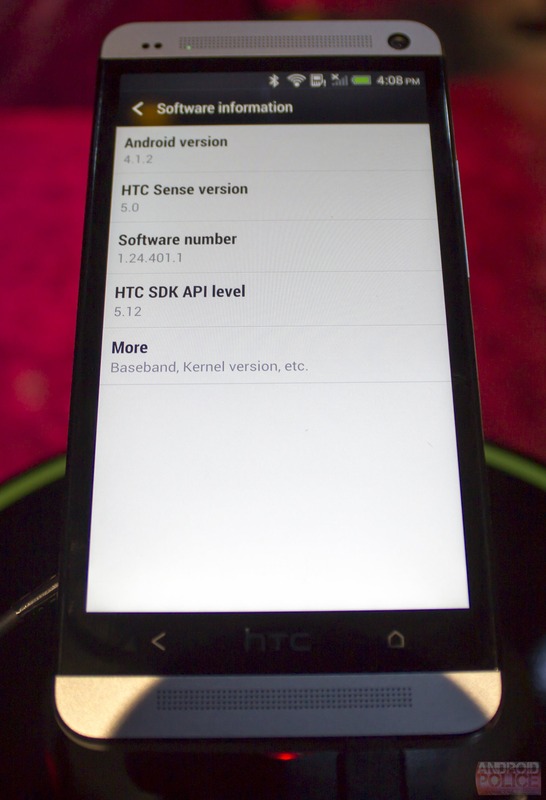 Aesthetically, HTC has toned down the gaudy, gradient-filled look of Sense 4, for something that looks almost minimalist in comparison. There are still a few gradients, but they are used sparingly, and in general, everything seems a lot flatter. It’s certainly better looking than its predecessor. 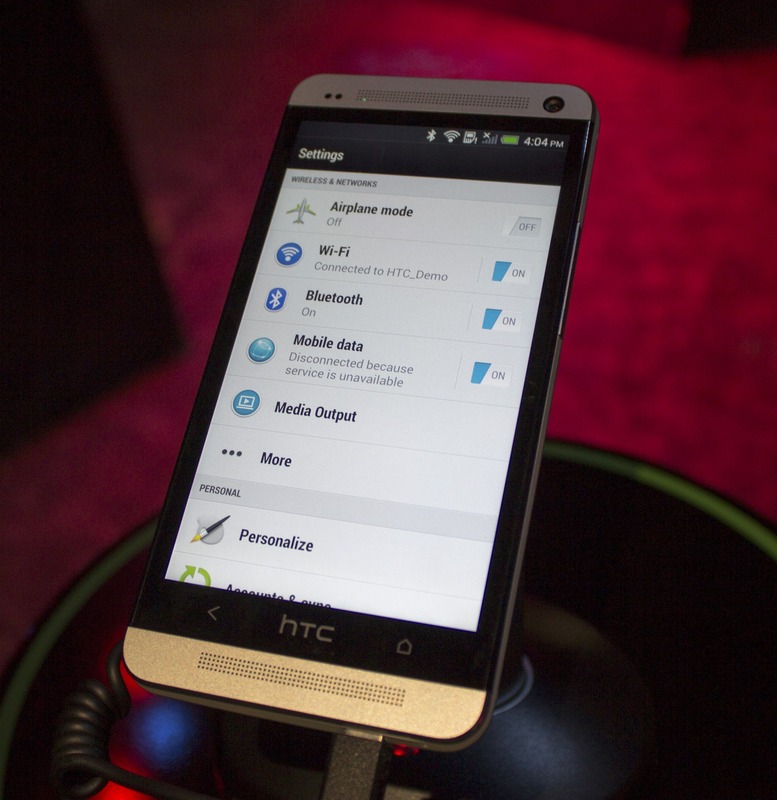 The highlight color has switched from green to blue, but HTC still kept their trademark green color on things like the icons and battery. The text has a very tall, condensed design that gives the feeling that everything has been squished together. It’s like they took a normal OS and put it in a vise for a few turns. I don’t really like it, just because text’s primary purpose is to be readable, and no text on any other digital device I own looks like this. Why have a big, beautiful screen and then act like you can't afford the space for lettering of a proper width? HTC has this crazy picture feature called "Zoe" which will automatically add a soundtrack and image effects to your pictures and videos. As you can see from the video, it mostly functions as an audio/video blender. It seems to turn out bizarre, disjointed footage of unrelated items. I don't get it. So, on the plus side, awesome build quality, speakers, and screen, and on the negative side, a crazy button layout, and some questionable software decisions. I really like the direction HTC is going in - no one is building premium phones, and this feels like one. I just wish they would leave the buttons alone. Only having two is just crazy, and it sends the message that they cared more about logo placement than usability. It's a shame, really. I only had a limited time to play with the HTC One, so for a more in depth look, we'll just have to wait for a review unit. 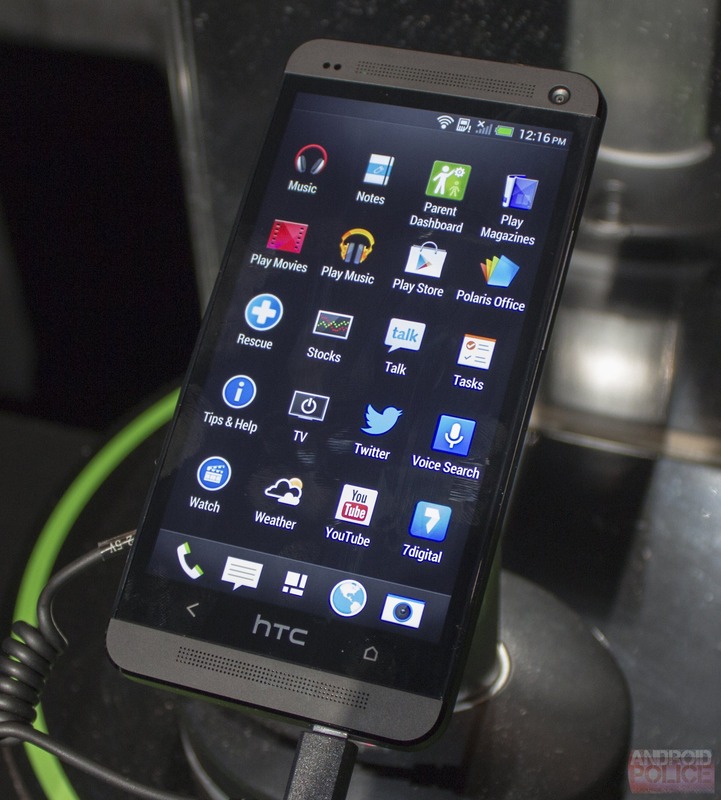 HTC says the One should be out in late March. Are you interested?